We’re quite spoilt in Suffolk, aren’t we, for pretty market towns; winding streets with pastel- washed buildings and higgledy houses dating from the bygone years of wool traders in the county. Hadleigh is at the very heart of all this and more than worthy of a visit for any number of reasons but we’ve discovered a new motive for jumping in the car and wending our way along the A1071 – The Hadleigh Ram. For those who knew the establishment in its former life you must start with a blank canvass as new owners, the family run group Stuart Inns, has stripped the building bare of its previous existence and created a whole new offering. Managing the transformation from town inn to stylish bistro has been a true family effort. The renovation project has been led by Iain Macmillan while his sister and the groups Marketing Manager, Lorna, has had hands on involvement with the styling and Executive Chef brother Ollie has overseen all things ‘kitchen and menus’. 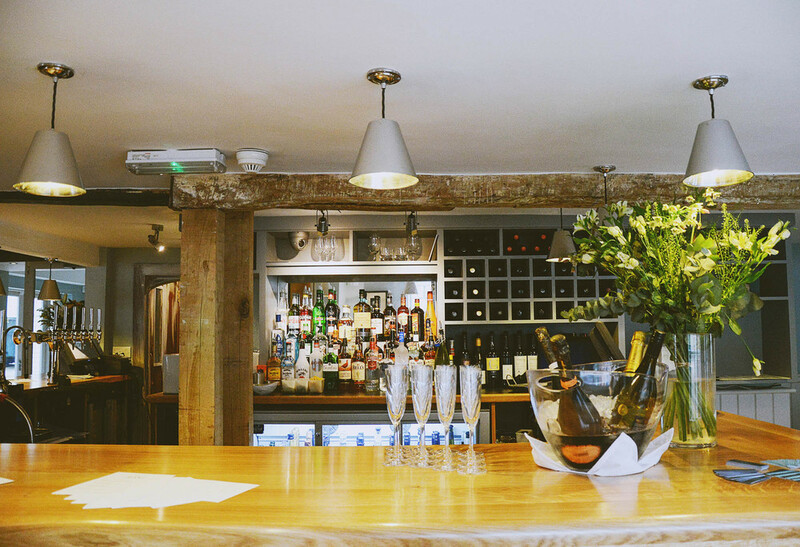 This team of siblings are no strangers to running successful restaurants as their other business, the Swan at Long Melford, is testament. “I had some very strong ideas about how The Ram should look and feel and working with Lindsay Barrs of Amor Interiors (Sudbury) we’ve sourced some really great finishing touches that work to complement the over-all scheme” Lorna commented. “We wanted to keep the cosy country feel that’s so in keeping with the style of the building but with the added ‘chic’ of the twenty first century”. What they’ve achieved is exceptional. We arrived to dine on a perfect summer evening and so chose first to cool off in the courtyard garden but no sooner had we ordered drinks than the storm clouds gathered and the rain started so we retreated indoors. The Ram is one of those buildings that has expanded through time and so there are a number of different seating areas, including a room that can be used purely for private functions as required. We settled at a table at the far end of the restaurant, near what in winter will I’m sure be a very welcome wood-burner. We knew from chatting to Lorna how passionate Ollie is about food. “He loves using only the best local ingredients to create really deliciously and diverse menu choices” she’d told us and it wasn’t an exaggeration. Ollie with his Kitchen Team at the Ram, headed up by Nick Traher, have created an inspired menu. Pork hash with fennel pear chicory and parsley salad, salt hake mousse with saffron cream velouté and potato rosti or Tarte Tatin of shallot and hazelnuts with confit cherry tomatoes all jumped off the page and straight into our discussions. Eventually we settled on seared breast and braised leg of Wood Pigeon with gooseberry and apricot chutney, watercress and truffled brioche for my husband and scallops served with Stornaway black pudding, podded peas and Parma ham as my starter. The classic flavours of the fish dish beautifully melded to get my meal off to a very promising start while the wood pigeon was instantly ranked alongside other very notable versions of this favoured bird. I’m such a sucker for rich dark meats and the lure of ‘Tasting of Lamb’ comprising cannon of lamb, kidney, sweetbreads, braised gem, paprika and almonds and next on the list roast duck breast with sauerkraut bubble and squeak and charred cauliflower was almost too much to resist but the balmy evening was calling for a subtler, lighter choice. Usually in such a situation I’d go straight for the fish but inviting as the cod loin with cracked wheat, samphire, courgette and brown shrimp sounded I decided instead to break with the norm for me and order chicken. I don’t usually choose chicken when dining out simply because we eat so much of it at home and to be brutally honest, while I care that my chicken had a happy life, it’s often a challenge to identify any discernible difference in the flavour between the free range birds we buy and the odd hurried shop for whatever is on the shelf. But I don’t think this dish was created from just a ‘happy’ chicken, no. I think this chicken was ecstatic and could well have spent its days in the equivalent of a health spa waited on beak and claw. Corn fed and presented in three ways; roasted, leek ballontine and as a lollipop the flavour was intense. Tiny rainbow carrots, cumin and chervil potatoes made perfect accompanying vegetables. Mr R stuck to his guns with his favourite –free range pork – so abundant in our County and a very good measure of Chef’s ability to stand out from the crowd. The perfectly roasted tenderloin came with pickled apple puree and baby fennel but the element that really got us talking was a clever twist as the fondant potato was stuffed with black pudding crumble. I have a feeling that a Chez Rawlinson version may be reaching our Sunday dinner table this autumn! There’s no shortage of wine choices at The Ram. Alongside the very full wine list we were interested to see wines of the month suggested on the table. A glass of Ondarre Graciano Rioja went down very well with the pork and one of my favourite touches was the miniature ice bucket complete with tiny tongs that arrived with our water, apparently an idea Lorna had picked up on her travels! A zesty orange parfait with blood orange sorbet for me and home-made stem ginger ice cream (with a side order or chocolate ice cream!) for Adrian suitably rounded off our meals and with coffee to follow we enjoyed a chat with Marta our waitress. In fact it is rather remiss of me not to have mentioned the exquisite care taken by the front of house team throughout. We watched as they carefully, cheerfully and diligently went about their evening service – each table given the same exacting attention. So, our advice; head Hadleigh way. Visit The Ram, enjoy the ambience, savour the menu and add a new venue to your list of superb places to eat in Suffolk.